I don’t know why I am so late to the game but I recently discovered a love of ramen. Not just the generic pack of dry noodles, but meat and veggie packed delicious ramen. It’s like Top Ramen on flavor packed steroids. I have a couple different recipes that I have been trying out but this one is the most recent one I have come to enjoy. It takes a bit of time to prep in the morning, but then it comes together in about 15 minutes when you get around to cooking it all up. Perfect for all those with busy lives who want a fast and tasty quality meal. By the way, you won’t believe how amazing the marinade smells. I think my mouth was watering the entire time I was making this recipe. Heck, my mouth is watering just writing about it. Note: I made this recipe using new york steaks and it yielded a very tender meat. You can certainly use a one-pound flank steak for a more budget friendly recipe. If you are short on time in the morning (I mean who isn’t), you can prepare the marinade and slice the meat the night before keeping them separate and then add them to the ziploc bag in the morning. Just don’t marinade the meat overnight. Mix together all the marinade ingredients (except the meat) in a small bowl and set aside. Cut the meat against the grain in 1/4-inch-thick strips. Place the meat in a ziploc bag and poor the marinade into the bag. Seal up the bag and place in the fridge to marinade for at least 2–8 hours (no more than 12 hours). Bring a pot of water to a boil and cook the ramen for 2 minutes. Strain the noodles in a colander and rinse with cold water. Cut off a bottom corner of the bag over the sink and allow all the marinade to drain out. Transfer the meat to a small bowl and toss with the cornstarch. In a large skillet heat two tablespoons of olive oil over medium high heat. Add in the meat and sear on both sides until the meat is cooked but still tender, about 2 minutes. Transfer the steak to a plate. Reduce the heat to medium and add the sesame oil, brown sugar, ginger, soy sauce, beef broth, and worcestershire sauce to the skillet and bring to a simmer. Stir and cook uncovered until it thickens, about 5–7 minutes. Add the broccoli to the skillet and cover with a lid cooking it for 3 minutes. Remove the lid and add in the meat and pasta. Toss everything to coat and heat for an additional 1–2 minutes. Transfer to bowls or plates and season with crushed red peppers and green onions. I decided to try and simplify the usually overly complex enchilada process. 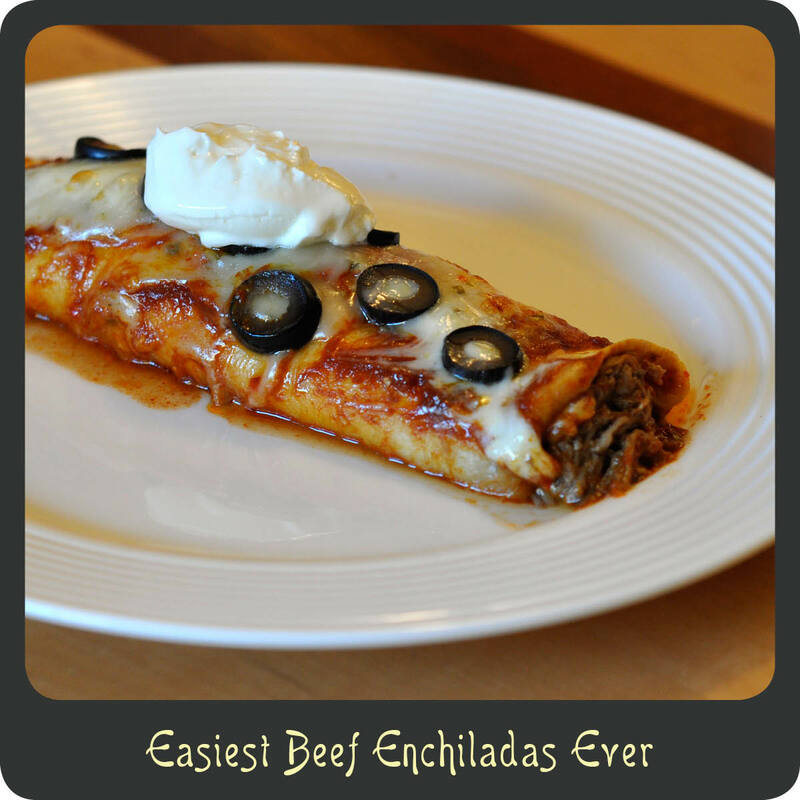 The name of this recipe describes it to a “t.” I am a huge fan of enchiladas. I make them fairly regularly but when I do the kitchen ends up in total disarray because of all the work that goes into them. This recipe uses only 5 ingredients but makes enough food to feed a small army. Note: This recipe makes about 12 enchiladas. Since there are only 2 1/2 people in our household I cooked 4 that night and then put the rest into two 8” x 8” foil containers and froze them. That is 3 nights worth of dinner for about $5 a meal. Who can beat that? Cheap and easy. That is my style. Heat the meat per package instructions. After the meat is done cooking transfer it to a large bowl and toss with 1 1/2 cups of the enchilada sauce. Spray your baking dish(es) with a non stick spray or lightly grease. Pour enough enchilada sauce in the bottom of your baking dish(es) to cover the bottom. On a large cutting board, lay a tortilla out flat and add a scoop full of meat and sprinkle with cheese and a few of the sliced olives. Roll up the enchilada and place seam side down in your “sauced up” bake dish and repeat until you are out of ingredients. Pour the remaining sauce over the tops of the enchiladas. Sprinkle with remaining cheese and olives. Remove foil and finish off in the oven for another 10–15 minutes or until the cheese is nice and melted and just starting to brown. 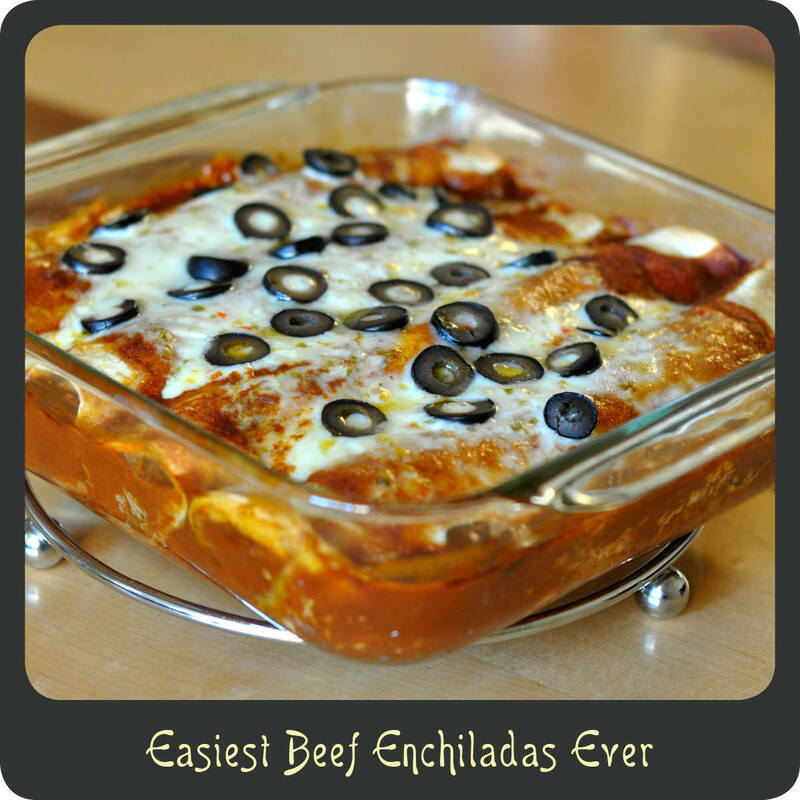 Allow the enchiladas to cool for 5 minutes before serving. Top with sour cream or guacamole if desired. A huge thank you to Del Real for giving me the opportunity to try out several of your products. I love them all! You guys rock! Looking for a family friendly recipe that both you and the kids will enjoy? Then search no more! Don’t have kids, no worries. Everyone loves these regardless of age! My 4 year old loves helping to crush all the saltine crackers. I just put them in a zip loc bag and he goes to town with his toy hammer. (Cooking is a family affair in our house.) 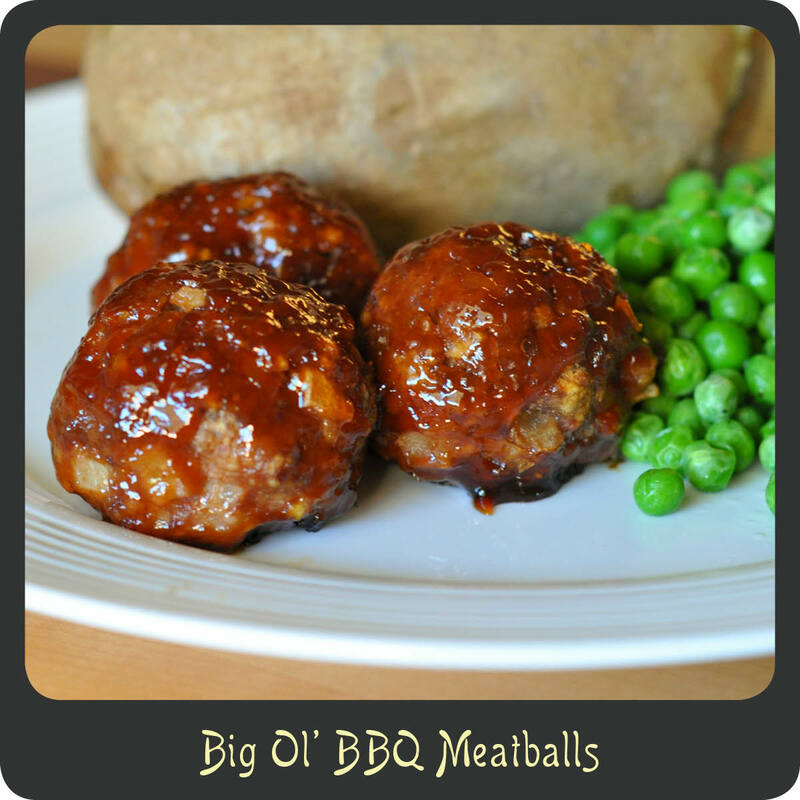 These big ol’ bbq meatballs are huge on flavor and so easy to put together. The brown sugar in the sauce helps to glaze the balls giving them a nice even coating of the sweet and tangy sauce. Yummy! These are the perfect comfort food as the weather cools off. I served these as a main dish but I could totally see making these smaller and serving them up as a party appetizer. Hope you enjoy these sticky saucy balls as much as I do! Note: The sauce for these balls ends up being super sticky so I HIGHLY recommend lining your cooking sheets with parchment paper to help with cleanup. Otherwise you are going to have a super sticky glaze all over your baking sheets, which will not be very easy to clean up. If you do not have parchment paper then I recommend spraying your cookie sheets with a nice coating of cooking spray. Preheat your oven to 400º. In a large bowl combine the ground beef, onions, crushed crackers, eggs, salt, pepper, honey mustard, 1/2 cup of the ketchup, and the Worcestershire sauce. Using your hands combine all the ingredients until well blended. Grab a handful of the meat mixture and roll into 2″ balls. Place the balls on a parchment paper lined baking sheet (see above note) and repeat until you are out of the meat mixture. While the meatballs are baking mix together the remaining 1/4 cup of ketchup, bbq sauce, and the brown sugar. Remove the baking sheet from the oven after 20 minutes and top each ball with a spoonful of the sauce. Place the meatballs back in the oven for another 10 minutes to allow the sauce to melt and coat the balls. Is your mouth watering just looking at this picture. Okay good. That means you are still alive. 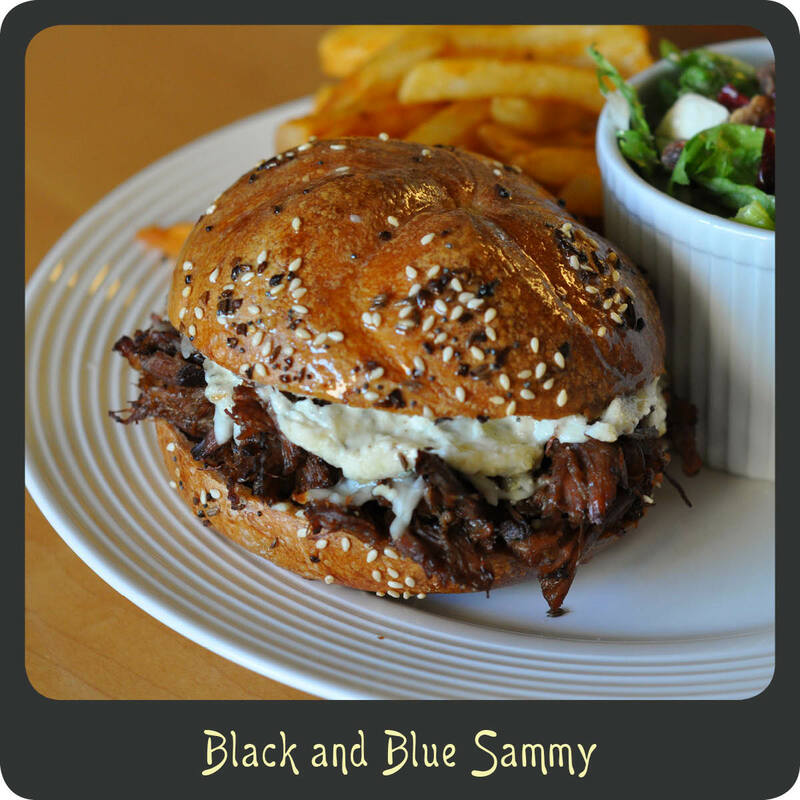 I am a sucker for beef with any kind of blue cheese. A filet with a blue cheese crust, I’m all over it. A burger with blue cheese crumbles, yes please. Just something about those flavors together is so perfect. When I saw this recipe I knew I had to try it. This sandwich is beyond decadent. The little bit or horseradish mixed in with mayo gives it a nice little bite and all the cheese melted over the tender beef. OMG! So good! And guess what? It is easy to boot! You cook the meat in a crock-pot allowing all those flavors to soak in and then all you have to do when you are ready to get your grub on is assemble them. Perfect lunch or dinner for these Sunday football games. Note: I made these as meal sized sandwiches but they were super rich. If you are someone who really just wants rich food in a smaller quantity or want to feed more than four people, then consider making these as sliders. This recipe will make about a dozen sliders if you use small dinner rolls. Sprinkle with the sugar, thyme, celery seed, and garlic. Add the bay leaf and soy sauce to the crock-pot. Cook for 4–5 hours on high of 7–8 hours on low. Remove the meat from the crock-pot and shred using 2 forks making sure to pull out any fatty bits. Add the prepared meat back to the crock-pot and keep on low heat. Cut your dinner rolls in half and lay the bottoms on a baking sheet. Using tongs grab a heap of the shredded meat and squeeze out all the excess juices and place on each bun bottom. Sprinkle each meat pile with a bit of the shredded mozzarella and blue cheese crumbles. Combine the mayonnaise with the horseradish and spread on the underside of each bun top. Place the lids on the sandwiches. Melt the butter in a small bowl and mix in the Worcestershire sauce, poppy seeds, sesame seeds, and onion. Brush the butter mixture evenly over the tops of the sandwiches. Cover the baking sheet with foil and bake for 10 minutes. Recipe adapted from Heather Likes Food. One of my favorite Mexican restaurants when I need a quick fix has got to be Chipotle. You can get quality flavor packed food in a jiffy. My go to is their carnitas and my husband can’t resist their barbacoa. It is kind of funny, Chipotle’s barabcoa meat literally makes him sweat when he eats it. But he still loves it! I can’t help but laugh as soon as the sweat starts to bead up on his forehead. Does anyone else do this when they eat something with a little kick? I swear it reminds me of something from a cartoon. I love that guy. 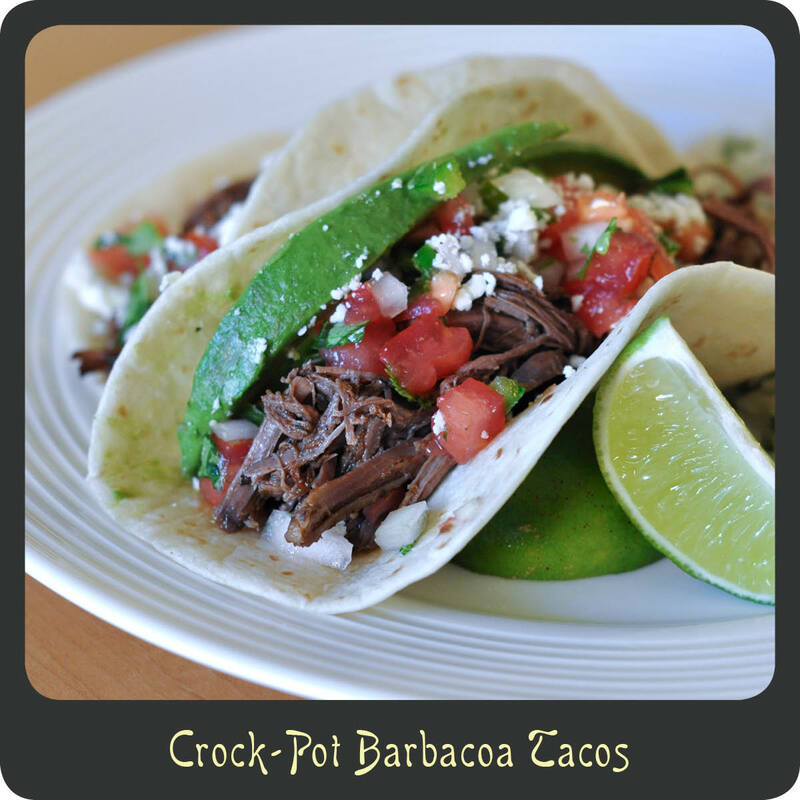 I made this recipe and it is without a doubt a near perfect match of Chipotle’s barbacoa meat. 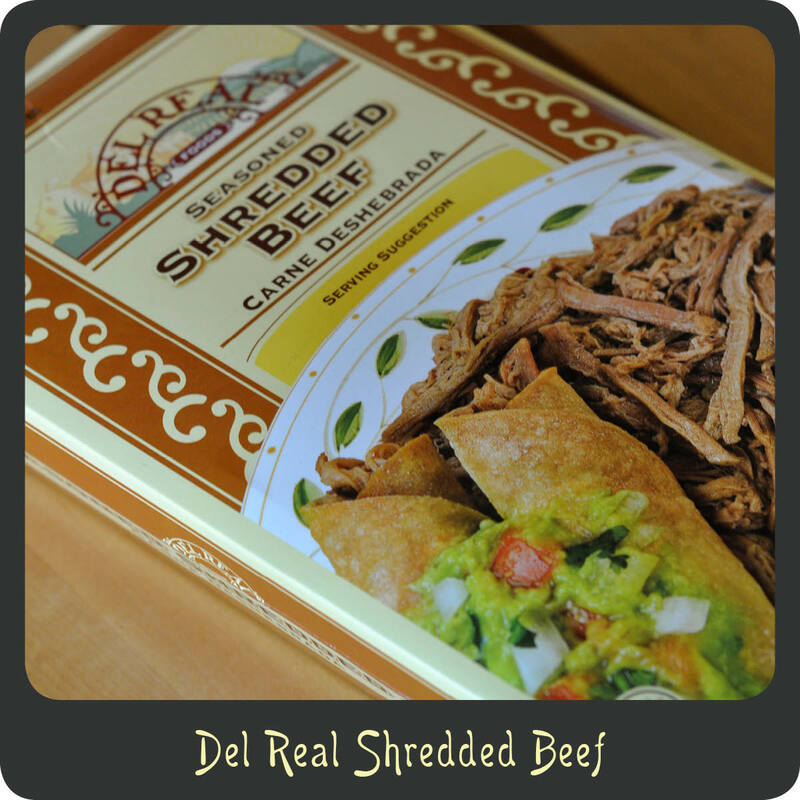 It is a tender, juicy, flavor packed meat perfect for burritos, tacos, or even nachos. I personally love it with a side of my Cilantro Lime Rice. Muy bien! Note: This meat definitely has a bit of heat in it from the chiles in adobo sauce so if you have a member of your household that doesn’t like heat I would either cut back the chiles or leave them out completely. Trim excess fat off of the roast. Spray your crock-pot with cooking spray (this helps a good deal with cleanup). Place all of the ingredients, except for the chuck roast, in the blender and puree. Pour the pureed sauce over the roast. Cook on low for 8–10 hours, or high heat for 5–7. When the roast is done cooking, transfer it to a large cutting board. Using a large fork shred the meat and place it back in the crock-pot to soak up some of the tasty sauce. Serve in a warm tortilla with your favorite taco toppings.